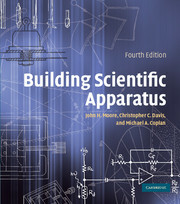 Unrivalled in its coverage and unique in its hands-on approach, this guide to the design and construction of scientific apparatus is essential reading for every scientist and student of engineering, and physical, chemical, and biological sciences. Covering the physical principles governing the operation of the mechanical, optical and electronic parts of an instrument, new sections on detectors, low-temperature measurements, high-pressure apparatus, and updated engineering specifications, as well as 400 figures and tables, have been added to this edition. Data on the properties of materials and components used by manufacturers are included. Mechanical, optical, and electronic construction techniques carried out in the lab, as well as those let out to specialized shops, are also described. Step-by-step instruction supported by many detailed figures, is given for laboratory skills such as soldering electrical components, glassblowing, brazing, and polishing. 1. Mechanical design and fabrication; 2. Working with glass; 3. Vacuum technology; 4. Optical systems; 5. Charged-particle optics; 6. Electronics; 7. Detectors; 8. Measurement and control of temperature; Index.